Why is it so astounding? 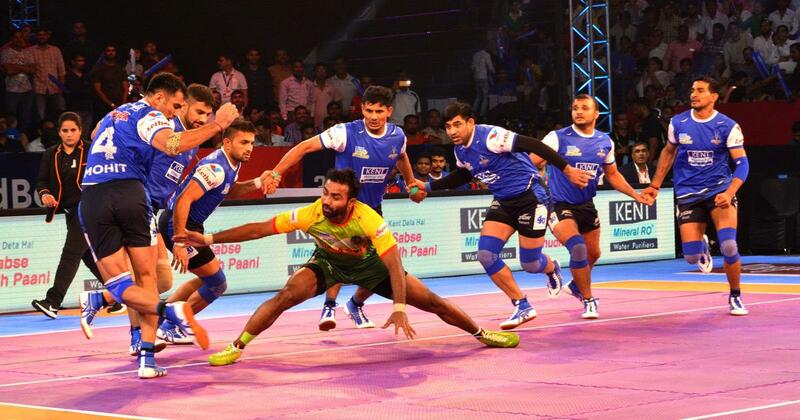 When the Pro Kabaddi League first came into existence in 2014, Rakesh Kumar became the highest earning Kabaddi player when Patna Pirates absorbed him for INR 12.8 Lakhs. Fast forward to season 4 of the PKL Auction, Mohit Chillar got a 10 fold hike in salary when Bengaluru Bulls grabbed him for INR 53 Lakhs (as opposed to INR 5.75 Lakhs in season 1). Thanks to the success of the league, the team’s budget cap was increased from 2 crores in season 4 to 4 crores in season 5. This shot up the maximum prices as well and directly led to Nitin Tomar becoming the record signing at INR 93 Lakhs. Since there were budget cap increases each time, the increase in salaries was also justifiable. What happened in the most recent auction in May 2018 is different. 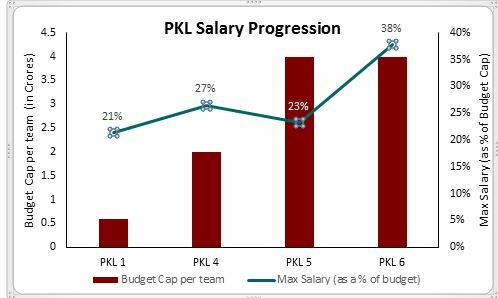 The budget cap per team has remained unchanged from the previous auction at INR 4 crores but the maximum player salary has still seen a 62% increase from INR 93 Lakhs to INR 1.51 Crores. The chart above shows that Monu Goyat will amount to an unprecedented 38% of the Haryana Steelers wage bill. Why could that be? The bulk of the reason for that is rule changes for this season’s auction. Let’s find out how rule changes led to Monu Goyat’s inflated price. Before the auction for season 5, teams were allowed to retain up to one player from their existing PKL 4 squads. These retained players were to receive 10% higher wages when compared to the highest priced purchase in the auction. This meant that the teams already knew one player of their team with the wage column reading ‘TBD’. Since the wage would be 10% more than the costliest auction purchase, the teams had to restrict their maximum spend on a player. For example, if Bengal Warriors had decided to purchase a player for INR 1 crore, they would have had to pay INR 1.1 Crore to Jang Kun Lee (their retained player). This would be difficult as they would have just two players (out of a minimum 18) for 55% of their budget. They would have had to deal with a sub-standard remaining squad. The highest priced purchase in the season 5 auction was Nitin Tomar who was notably purchased by UP Yoddha, a new team who did not have a player to retain. This season, the teams were allowed to retain up to 4 players at a 10% increment of their wage from season 5. The teams chose to retain 21 players for INR 10.13 Crores; 21% of the wage bill for 10% of the minimum acceptable squad. In general, that might look like over-spending but since this included key players like Pardeep Narwal and Ajay Thakur, this is actually a bargain. This was another new rule introduced for season 6 of PKL. Teams were allowed to retain up to 3 young players at another INR 6.6 Lakhs (10% uptick on their original purchase value of 6 lakhs) each. Teams chose to retain another 32 players for INR 2.1 Crores. Clubbing this with the Elite Player retentions, teams had a total of 53 players for INR 12.25 Crores; 25% players for 26% of the wage bill. Now, we’ve restored parity before the auction. But there’s more. This was not a new rule. This was introduced for season 5 of PKL. Before the auction for category A players, there was a draft where teams could acquire up to three NYPs for INR 6.6 Lakhs each. Another 17 players were purchased for INR 1.12 Crores during the draft. Adding this to the retained players, 70 players were sold before the auction for A category players; 28% of the wage bill for 32% of the minimum acceptable squad. By the time the auction for Category A players started, the teams were much more stable. They had their core team in place and also had a strong young squad. From the auction, they needed key players to fill in for certain key positions in their teams and had a lot of budget for achieving that. This was the key difference when compared against the previous auction. This is what inflated the player prices during the recently concluded auction. At this stage, 4 of the 12 teams had more than INR 3.6 Crores to spend. Raiders being the most prized commodity in Kabaddi, there was every chance that a raider went for an amount as high as INR 1.5 Crores. Owing to his performance in PKL 5, Monu Goyat had leapfrogged on the list of the best raiders in the auction. Even before the season 6 auction, Rishank and Monu were being touted as equals to the likes of Rahul Chaudhari, Nitin Tomar and Deepak Niwas Hooda. Unsurprisingly, all five of these guys crossed the magic 7 digit barrier during the auction. What transpired during the auction made Monu the prime candidate. There was another new addition to the auction rules this season. The Final Bid Match card allowed the teams to re-purchase a player who represented them in PKL 5 by matching the highest auction bid for the player. This card foiled the best efforts of Dabang Delhi (Rishank and Rahul) and Haryana Steeler (Jang Kun Lee) as they tried to buy a premier raider for their team. Monu was the second last A category player to be auctioned. 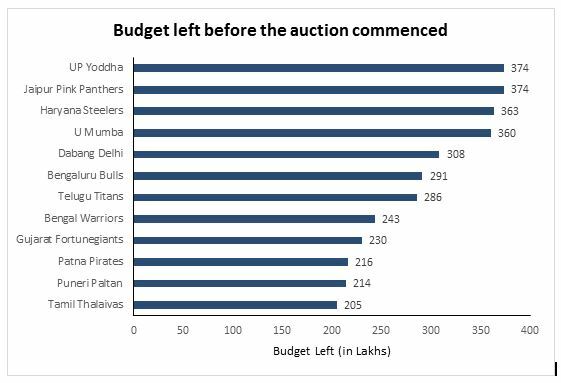 By the time Monu went under the hammer, all other premier raiders were already auctioned with Dabang Delhi, Haryana Steelers and U Mumba still in desperate need for a lead raider for their teams. These teams also had the budget of 3-3.5 Crores to spend. With all A category players sold already (other than Parmod Narwal and Ravinder Pahal, who was unsold), Monu became the last hope of these teams to salvage something concrete out of the auction. We believe that any of the premier raiders who had been auctioned at that stage would have gone for more or less that very amount. All in all, the introduction of new rules like the elite player retention, young player retention and the Final Bid Match were the primary reason for inflated prices. Also, the stars aligned perfectly for Monu Goyat to be the highest earned player. Congrats Monu! This entry was posted in Kabaddi and tagged Monu Goyat, PKL 6 Auction, Pro Kabaddi, SportsKPI, vivoprokabaddiauction. Bookmark the permalink. In no time he has become one of the latest posterboys in Indias cash-rich Pro Kabaddi League (PKL) but U Mumba skipper Fazel Atrachali, the Iranian defender, feels it is a tough task to become a standout player in a country like India, the powerhouse of this game for several years.